George paid a short visit to Australia recently. The visit was purely informal. 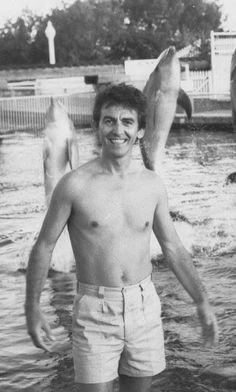 It was the first time George was in Australia since 1964. As some of you may be sorry to hear, it was not for any sensational reason that George flew over. The truth is that he was looking towards buying land, or maybe a farm, either in Queensland or New South Wales. His visit was very hushed-up, and not too many people knew about his arrival. George had hired some bodyguards (Bob Jones Co.) who usually look after rock stars. However, at the last moment abandoned his plan, because they would, after all, only bring more attention to his visit. 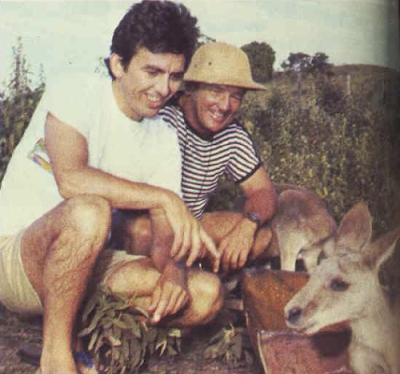 George first landed at the Queensland airport in early March (1982), believed to be with his wife and son. After the plane had landed, George and company were away in a helicopter in a flash. He stayed with Bobby Jones (no, another one), a racing driver on the Gold Coast, in his penthouse, and that same week moved to the farm of another friend of his, tourist entrepreneur Keith Williams, whom he met through their mutual friend, racing-driver Jackie Stewart. The second week George was spotted in New South Wales, where he invited the WEA staff out to lunch. (If only George knew how THAT record company treated his releases: with no promotion at all, his latest LP hardly made the charts, although it was still the peak of all his WEA releases). 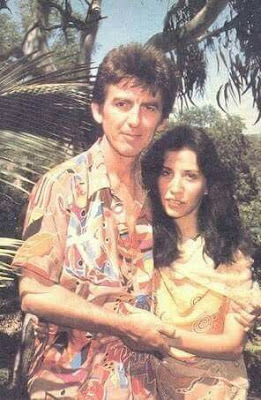 But then, I suppose WEA sucked up to George all the way while he was in Australia. After this, he travelled down to Melbourne, Victoria, where he stayed with yet another one with that surname, Alan Jones, world champion racing driver, on his farm for a few days, and then landed back in Queensland from where he flew off in the last week of March. Now, if you ask me the question whether George did acquire land or not, I have to admit I don't' know. If so, it would be probably mean that he would live in Australia at least a few weeks every year, which would put Australia a bit more into the picture, Beatlewise. The reason why George wants to buy a farm in Australia, at least "somewhere in the South Pacific" is that he's taken up gardening since he bought his Friar Park estate at Henley. He's specifically interested in growing tropical plants, and British weather being what it is these days, this would mean buying another garden somewhere else. 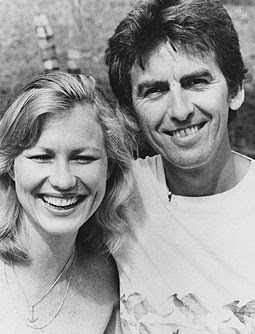 George and Olivia are both semi-vegetarian, which means they do eat chicken and seafood. Son Dhani, now 3 1/2 years old, is a total vegetarian. His name, by the way, does not mean "wealth" as was first reported, but "dha" and "ni" are two notes of the Indian music scale. Sort of "do-re" one might say. He speaks upper-class English contrary to his parents. George is still financially involved in the Hare Krishna movement. He donated a mansion to them in Hertfordshire worth about $500,000. The interview also says that he often does anonymous donations to people and institutions, such as the Monty Python team (which is not exactly a secret) and to Barry Sheene, to whom he once is said to have offered $280,000 NOT to take up Formula One racing because George thought it too dangerous for his old friend. Also, Ravi Shankar and he are still trying to get the proceeds of the Bangladesh concert (now 11 years ago) to the people who are still so desperately in need of it. completely brilliant images - ta Sara!